SAN DIEGO--(BUSINESS WIRE)--Today Swisse Wellness, Australia’s number one multivitamin brand, announced the U.S. relaunch of its most popular multivitamins and supplements which are now available for online purchase via Amazon, Walgreens.com, iHerb and other leading online stores. After a three-year hiatus focusing on global brand expansion in Europe and Asia, Swisse is back in the U.S. and delivering consumers premium quality supplements made from natural ingredients sourced around the world, including globe artichokes from Spain, blood oranges from Sicily and cranberries from Massachusetts. For over 40 years, Swisse prides itself on having the most stringent development and manufacturing standards to produce scientifically validated products that assist in maintaining optimal health and well-being. The company is dedicated to investing in education, research and innovation; bolstering the body of scientific evidence supporting supplements. Swisse’s multivitamin line (Ultivite®) contains more than 50 ingredients including vitamins, minerals, antioxidants and herbs, and has been independently verified by more than 13 published clinical studies indicating distinguishable improvement in stress and energy levels*. Swisse Ultivites are the daily foundation for healthy living and are complemented by a range of Ultiboosts engineered to provide targeted health support*. Swisse’s mission is to make millions of people around the world healthier and happier. The Swisse lifestyle involves not only making a habit of taking multivitamins and supplements, but also establishing a focus on positive thinking, nutrition and exercise - a mindset perfectly embodied by Swisse Wellness brand ambassador, Ashley Hart. The full range of Swisse’s products is formulated to support optimal health and well-being through all stages of life*. Swisse multivitamins and supplements currently available for purchase in the U.S. include Women’s and Men’s Ultivites, along with the following range of Ultiboosts: Liver Detox, Lecithin, Sleep, Calcium + Vitamin D, Grape Seed, Hair Skin Nails Liquid, Hair Skin Nails +, High Strength Cranberry, Chlorophyll Mixed Berry and Chlorophyll Spearmint. For more detailed information on these products, please visit the Swisse products page. Currently available in eight countries with plans to launch in up to 30 in the next five years, Swisse is in a new phase of global brand development and investment. The relaunch into the U.S. plays a significant role in Swisse’s global strategy and strengthens the brand’s position in the overseas market. Swisse is an Australian health and wellness company dedicated to making people healthier and happier through clinically evidenced natural health products and education. Established in the 1960s, Swisse offers an extensive range of vitamins and supplements containing premium-quality, natural ingredients based on decades of independently verified scientific research. Today, the Swisse product range stretches from top selling men’s and women’s multivitamins and dietary supplements, to sports nutrition, skincare and functional foods. Swisse products are currently available in the U.S. (online only), Australia, New Zealand, China, Singapore, the UK, Italy and the Netherlands, with plans to launch in up to 30 countries in the next five years. 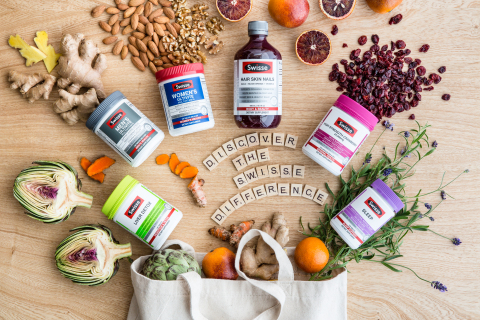 Swisse Wellness, Australia's top multivitamin brand, announces its premium vitamins and supplements are now available for online purchase in the U.S.